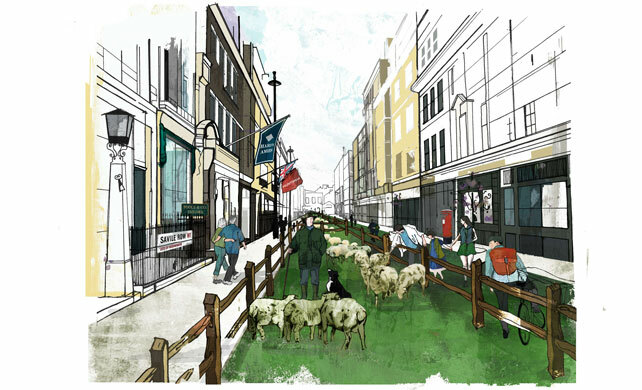 Another short piece in GQ last week, this time telling the world about next Monday, October 11, when Savile Row will be turfed and covered with sheep. Perhaps more importantly for those interested in bespoke tailoring, there is a whole roster of events being put on by the Savile Row houses, including talks, tours and live cutting, embroidery and knitting. So if you’ve always wanted to walk into Huntsman or Poole but weren’t sure quite what to say, pop along and get the tour. All details on the Field Day website. You can follow the discussion on Permanent Style in GQ: Field Day by entering your email address in the box below. You will then receive an email every time a new comment is added. These will also contain a link to a page where you can stop the alerts, and remove all of your related data from the site. those bah bah’s need some trees for shade. what do you think? Shade? From the blazing October heat? This is great news, Simon. I think it’s hilarious that people would criticise you for being in GQ. Do they not want it to have good writing, or feature the bespoke tailors they love? Is this press only or is there a chance for lay people to come and view the presentation? Hi Rob – it is absolutely for the lay man. That’s the point – to get people to Savile Row and having a look around. Go to the Field Day site and look through the schedule, then go to anything that takes your fancy!